Get up to 7 free auto shipping quotes from the largest, most trusted South Carolina auto transport companies and save up to 50% on your car shipping rates at CarMoves.com. Car shipping companies in South Carolina compete for your business, which is how you can save hundreds, if not thousands of dollars on car transport services by shopping with us. Whether you're shipping a car to South Carolina, across the country, or even overseas, we can help you get the best price on your shipment - guaranteed! Read more about the following auto transport companies in South Carolina before getting a quote. Click on the name of the company to read a full review. A-AAA Auto Transport A-AAA Auto Transport has been in the industry for 12 years, making it one of the more experienced auto transporters. The company provides white glover service to ensure that customers' cars remain clean. They also ship to Hawaii and Alaska, and certain other international destinations. AmeriFreight AmeriFreight is a relatively new, but successful, auto transporter, having begun business in 2007. To provide customers with better quality service, all cars shipped at rates above the "Economy Saver" rate are provided with GAP insurance. Discounts are available for a variety of customers. Auto Transport 123 Despite Auto Transport 123's late start in the auto shipping industry, this 2010-founded company has already garnered acclaim, such as being the year's "best reviewed auto transport company." Additionally, Auto Transport 123 includes a particularly generous $1,000,000 insurance policy on enclosed shipping. Bluestar Auto Movers Bluestar Auto Movers ships approximately 10,000 cars a year, making it one of the most prolific auto shippers in the market. Bluestar transports cars both nationally and internationally, and has a multitude of experience shipping cars bought online from sites like eBay. The company will even ship military vehicles at a discount. Honesty First Auto Transport Safe Direct Car Shipping, formerly known as Honesty First Auto Transport, is proud to describe their friendly, personal service. The company does not require an upfront deposit, and additional car shipping insurance is provided for all orders at no extra cost to the customer. Suncoast Auto Transport Suncoast Auto Transport is a Port Saint Lucie, Florida-based car shipping company. Unlike some other transporters, Suncoast refuses to use terminals and multiple drivers. They assure that cars will remain on the same truck for the duration of shipping, and customers can track their shipment easily online. Total Car Shipping Based in Hollywood, Florida, Total Car Shipping is a major auto shipper that has served over 40,000 customers during its tenure. They also specialized in shipping both domestically and internationally, and take no upfront deposit from their valued customers. Get a free auto transport quote today to find out how much it costs to ship a car to or from South Carolina! South Carolina is a small Southern state that has plenty of oceanfront property. The state is known as much for its green forests and surroundings as it is for its wonderful beaches and resorts. Most of the beaches there are found on the Grand Strand, a 60-mile long shore that contains Myrtle Beach and Surfside Beach. Along with the beaches, the eastern region of the state also contains numerous estuaries and bays, which lead into large swathes of marshland. Northern areas in the state are heavily forested, and its rolling hills are quite a spectacle for visitors. As residents quickly become aware of, weather in South Carolina can sometimes be quite volatile. The state does have the occasional earthquake, but far more devastating is the hurricane season, which has been known to wreak havoc upon coastal cities. 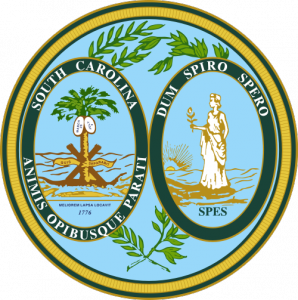 Historically, South Carolina was one of the original thirteen colonies and the eight state to ratify the Constitution, but was also the initial leader in promoting secession from the US and fighting the Union during the Civil War. Due to the institution of slavery and the popularity of farming and agriculture, a majority of the state's population was African American into the 20th century, and still retains nearly a third of the overall population currently. While its once agrarian past has receded, the state added to that perennial industry tourism and military bases to fuel the local economy. Despite these changes, the state continues to fly the Confederate flag at a memorial site dedicated to Confederate soldiers, and flew it over the state capitol until 2000. South Carolina's most populous city is its capital, Columbia. Columbia is located fairly inland in the state, just east of Lake Murray, and has a metropolitan population of over 3/4 of a million people. The city prides itself on offering a quality education at the urban University of South Carolina campus, a school with celebrated business, engineering and law programs. The development of the "New Main Street" downtown has already attracted several major businesses, and now is in the process of restoring and refacing many of the cultural attractions there, including the Nickelodeon theater. CarMoves.com works with car shipping companies throughout the state of South Carolina. We can help you get the best prices on car transport services to the following cities in South Carolina: Columbia, Charleston, North Charleston, Mount Pleasant, Rock Hill, Greenville, Summerville, Sumter and many more. If you don't see your city listed, don't worry - we can get your vehicle shipped anywhere in South Carolina. Scroll to the quote section on this page to compare free auto shipping quotes from up to 7 South Carolina auto transport companies and save up to 50% on your move! View the South Carolina Department of Transportation website for more information. Car Transport, Motorcycle Shipping and Truck Transportation is Our Passion. All Content Copyright (c) 1998-2012 www.carmoves.com All Rights Reserved.